Chlor SM Clorador Salino - ChlorKing, Inc. Converting your swimming pool to a salt chlorination-based salt water swimming pool is a wise move. Salt (or saline) chlorination utilizes technology to sanitize your swimming pool water rather than using traditional chlorine. This safer, more cost effective and environmentally friendly solution is used extensively in the residential (backyard) swimming pool market (over 70% of these pools use salt chlorination). As a result, salt water swimming pool systems have become very popular in the commercial and institutional swimming pool markets as well. 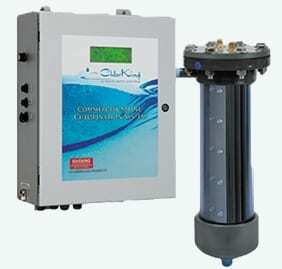 ChlorKing®’s patented system is simple, easy to use, and will provide years of trouble free operation ensuring your pool water remains well sanitized and sparkling clear. The MINI-reverse polarity series offers a compact water-cooled power supply for low maintenance and is available in three different models up to 5lb’s per day. The CLASSIC-forward polarity series offers a more cost effective solution featuring a water-cooled power supply and is designed for facilities or operators that have the ability to provide a low level of maintenance required to the clean the cell on a weekly basis. A lower price makes this series specifically attractive for pool management companies or owner/operator facilities. Sizes range from 5lb’s to 25lb’s per day in this series. 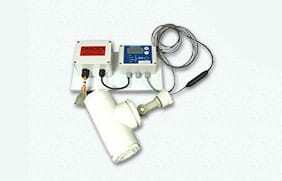 All models also feature our toroidal salinity control system that monitors the salt level in your swimming pool 24/7. This unique controller not only displays the actual salt in ppm on the screen, but also never needs calibration or cleaning. A powered output also allows for the addition of our Saturated Salt Feeders which will automatically inject salt into your swimming pool on demand, maintaining your water’s salt levels with no need for operator testing or manual salt introduction.